Hi everyone! 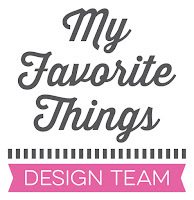 Today is the first day of the My Favorite Things November release countdown. This release is packed with amazing new products! You’ll love them! Most of the supplies I used for this project are linked in the list at the bottom of this post. I created a clean and simple scene using the sweet owl. I did a reflection on the ice using acetate (transparent sheet). 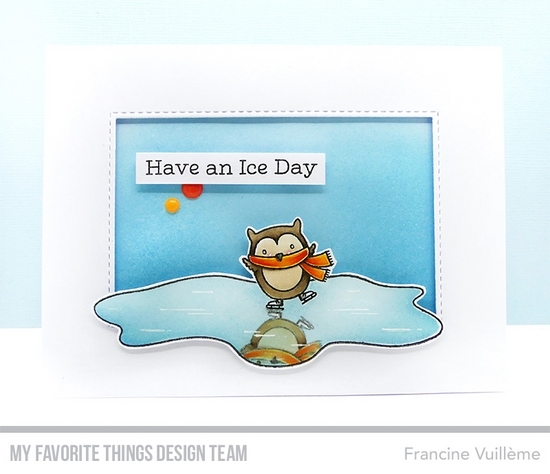 I first stamped the owl on white cardstock, masked the image and I stamped the frozen pond. Next, I masked the area around the pond. I then stamped the owl on a transparent sheet and I pressed the sheet onto the white cardstock below the owl. I removed all masks, colored the image and cut it. The opening was die cut using the Inside & Out Stitched Rectangle STAX Die-namics. I sponged the background using Distress inks. I decorated the card with enamel dots for more interest. Wow! The mirror stamping is just amazing! How clever you are, Francine! I love your CAS design and the reflection looks amazing! Such a sweet card! This is awesome, I love the reflection in the water! This is gorgeous, love that mirror stamping!! Awesome! Love the mirror image! Love the mirror image of the owl in the ice! Your mirror stamping/colouring is fabulous! What a delightful winter scene. Such an adorable scene ! The reflection in the water is amazing ! I honestly didn't get how you made it but that's because I'm French and my English isn't good enough. I love this card. Sure would love to see a video using the reflection technique. Visuals always work better, TFS. The owl is too cute!! I want the mirror stamp tool. Oh my goodness - that reflection is perfection! The reflection is spot on! Really cute card! Wow, I love this! thanks for the info on how you did it. I will absolutely try it! I love the mirror effect!Totally awesome!Thank you for the inspiration! OMG... You Nailed This! That reflective look on the Ice...Genius!!! Craft-Tastic!